U.S. Soccer has responded to the NASL’s antitrust lawsuit — not a full-scale rebuttal of the charges, but a complaint about the NASL’s desire to get to court as quickly as possible. Before all that: If USSF doesn’t agree to that schedule, then both parties should submit their proposed schedules by 10 a.m. Friday (Sept. 22, today). U.S. Soccer responded, “Dude, it’s Rosh Hashanah” (not in those specific words), and suggested Tuesday, Sept. 26. And yet, USSF came up with a briefing schedule by Thursday night. 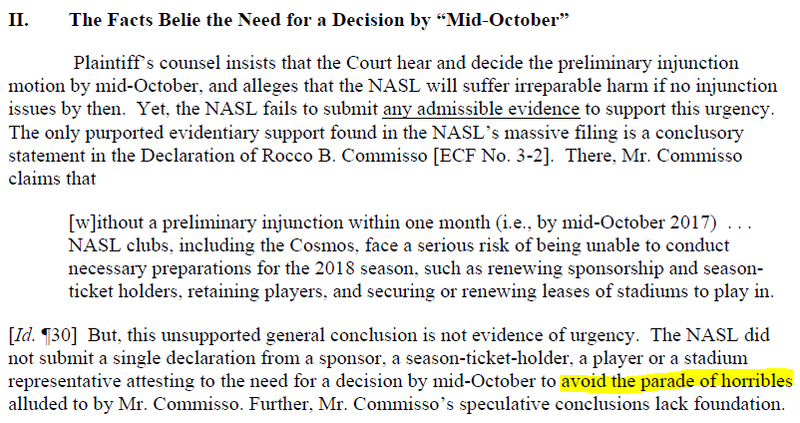 NASL didn’t respond to USSF, says the response, instead sending a letter to the court. 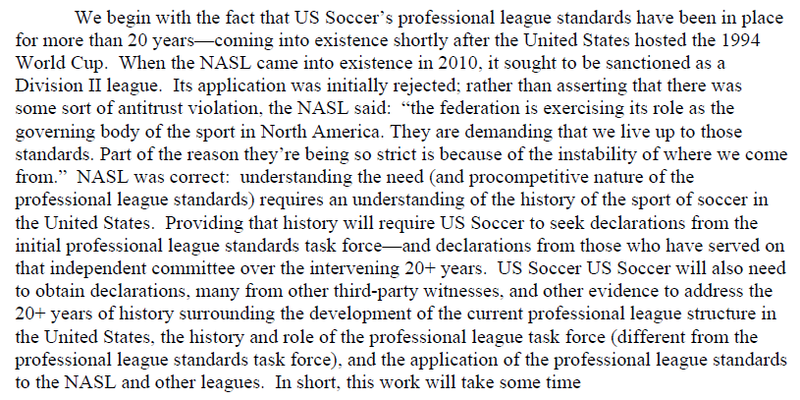 The next part: USSF points out that the sanctioning process usually doesn’t even begin until fall, with decisions in December. And this past year, Commisso bought the Cosmos from the scrap heap in January and managed to get the team on the field two months later. Next up: The “We can’t possibly do this in two weeks” argument. Which leads to a paragraph that is incoherent and yet interesting. I hope this case continues because I would really like to see declarations from the past and present members of these mysterious task forces. Many task forces and committees have reports in the Annual General Meeting report, in case you want to see what the Audit Committee or Open Cup Committee has been up to, but usually not the Professional League Task Force (which currently consists of U.S. Soccer staff, U.S. Soccer’s VP and a Paralympian from the Athletes Council) or the Professional League Standards Task Force (Lawyers R Us). The proposed USSF timeline is basically an invitation for Jeffrey Kessler and company to skip Thanksgiving this year. I’m no lawyer, but I think it’s safe to say the court isn’t going to buy a 13-day window there. My guess would be the USSF Opposition would be due before Nov. 17. Exhibit A is Jeff Carlisle’s ESPN story about Commisso bringing the Cosmos back from the dead. Exhibit B is Brian Straus’ SI story on the same topic.